This swing thought has you focusing on keeping the clubhead low to the ground during the early stages of the takeaway, and to do so in a slow manner. This is in contrast to lifting it from the ground early using your wrists and doing so in a rushed manner. Taking it back low and slow promotes a wide swing (in contrast to narrow and constricted), which itself promotes greater distance in shots. It also promotes good tempo and crucially, a proper acceleration through the ball. Golfers who tend to get wristy or handsy early in the backswing will benefit from this swing tip. Indeed, focusing on keeping the clubhead low to the ground as it is brought back will prevent the wrists from starting to hinge too early. Otherwise, those with bad swing tempo or those that often see their club decelerate through impact will also benefit from using this swing thought. By focusing on bringing the club back slowly, it almost guarantees a steady progression in rhythm as the club makes its way towards impact. In constrast, whenever golfers loses their rhythms and resort to rushing the backswing it often translates into the downswing traveling at a slower pace, the definition of a decelerating swing. Furthermore, by forcing the clubhead to remain low early you are keeping your wrists out of the equation in this critical stage of the swing. 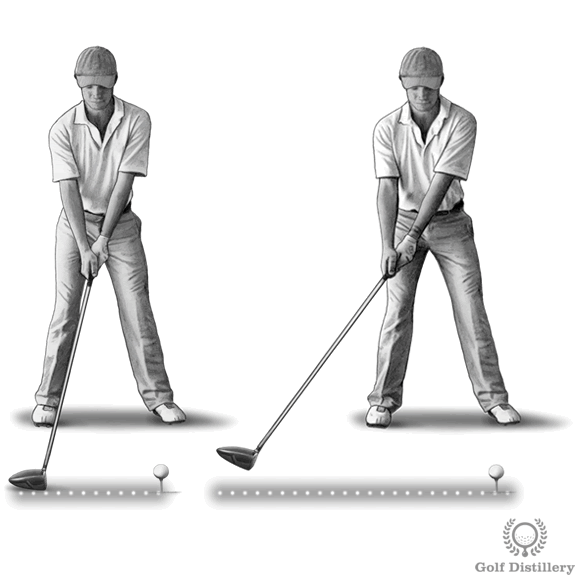 Indeed, it is impossible for the clubhead to remain close to the ground while the wrists are hinging up. This swing key is especially helpful for drives and shots using a fairway wood, where a long club warrants a wide swing. It is also with these clubs in hand that golfers will tend to rush their swing, incorrectly thinking a fast backswing will automatically translate into a fast downswing and a ball that travels far.